From Botas, the trusted name in ice sports comes The Regina. The new Ice Skate for the casual champion. It is not just the slick style or uncompromised design that will make you proud of your purchase, it is the lasting durability and unsurpassed comfort. Made for anyone from the weekend champion to the devoted skater hunting for the perfect score. Style, comfort, stability, durability, and dependability. Nothing has been held back when making this quality consumer ice skate. From the very first time you strap up the laces on the boot and glide across fresh slick mirrored ice, you will know you made the right choice in your ice skate. The Regina is a comfortable woman’s model Ice skate with a brand new design for recreational skating. This skate will be the talk of any ice rink you may skate. The beautiful white and brown color scheme goes well with any wardrobe you choose. The boot is made of a stylish and durable synthetic material that not only looks good but is also waterproof for lasting comfort during long skates. The Regina ice skate features a better more comfortable fit that you will find in no other ice skate on the market. Comfort meets stability with the upper padding and ankle padding. New with the Regina, the padding has been reinforced to provide unprecedented foot comfort. Making Hours on the ice feel a lot less like hours on the ice. The surface features a series of layered synthetic material with a top quality laminated synthetic waterproof inner lining. The Regina’s stylish sole is made of tough and durable damage resistant plastic. The Regina’s boot tongue Is made with a soft and comfortable felt lining. BOTAS Regina skates Have been honored many times over and have been awarded the coveted TÜV GS European certificate. Price: $79.95 – $99.95 & FREE Shipping. From Botas, the trusted name in ice sports comes The Regina. The new Ice Skate for the casual champion. It is not just the smooth style or uncompromised design that will make you proud of your purchase; it is the lasting durability and unsurpassed comfort. Made for anyone from the weekend champion to the devoted skater hunting for the perfect score. Style, comfort, stability, durability, and dependability. Nothing has been held back when making this quality consumer ice skate. 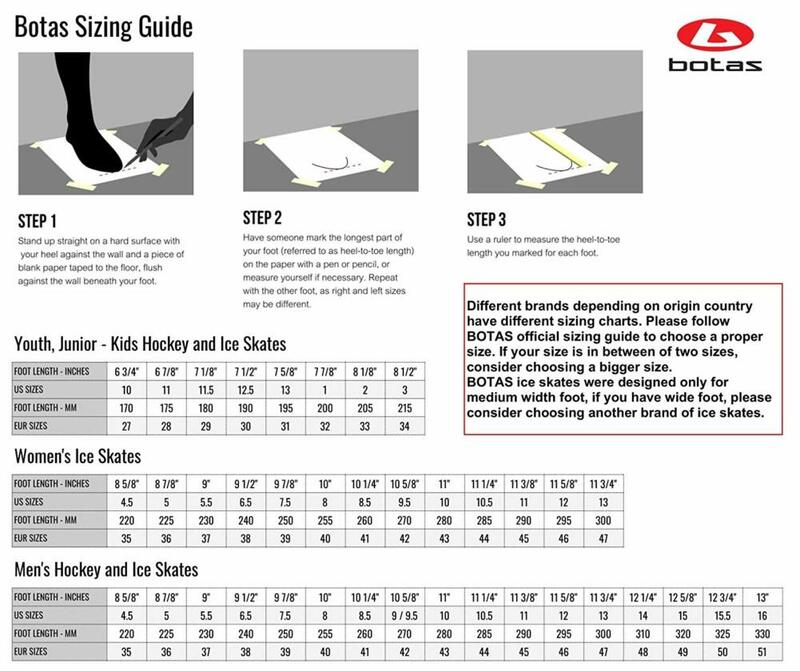 From the very first time you strap up the laces on the boot and glide across the new slick mirrored ice, you will know you made the right choice in your ice skate. The Regina is a comfortable woman’s model Ice skate with a brand new design for recreational skating. This skate will be the talk of any ice rink you may skate. The beautiful white and brown color scheme goes well with any wardrobe you choose. The boot is made of a stylish and durable synthetic material that not only looks good but is also waterproof for lasting comfort during long skates. The Regina ice skate features a better more comfortable fit that you will find in no other ice skate on the market. Comfort meets stability with the upper padding and ankle padding. New with the Regina, the padding has been reinforced to provide advanced foot support. Making Hours on the ice feel a lot less like hours on the ice. The surface features a series of layered synthetic material with a top quality laminated synthetic waterproof inner lining. The Regina’s stylish sole is made of sturdy and durable damage resistant plastic. The Regina’s boot tongue Is made with a soft and comfortable felt lining. BOTAS Regina skates Have been honored many times over and have been awarded the coveted TÜV GS European certificate.